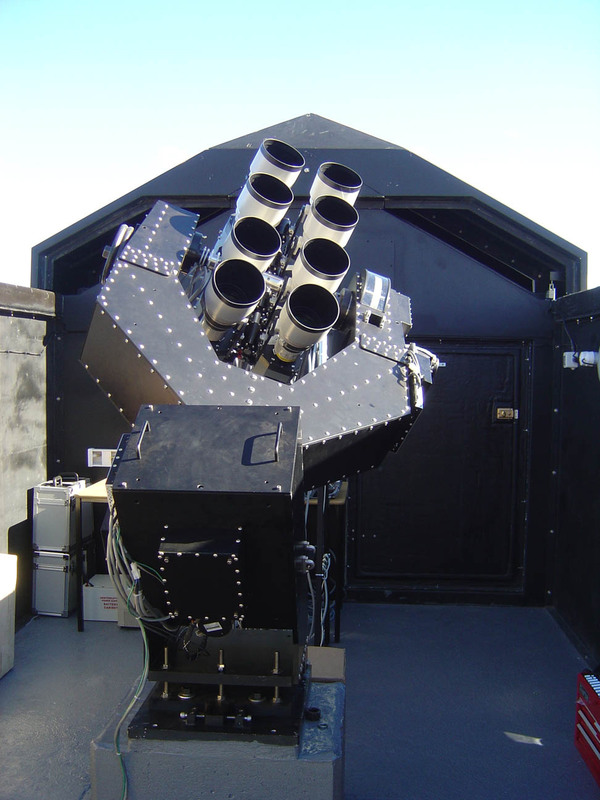 The SuperWASP cameras are wide-field imaging systems sited at the Roque de Los Muchachos Observatory and the Sutherland Station of the South African Astronomical Observatory. Each instrument has a field of view of some ~482 square degrees with an angular scale of 13.7 arcsec per pixel, and is capable of delivering photometry with accuracy better than 1% for objects having V~7.0–11.5. The systems, while designed to monitor fields with high cadence, are capable of surveying the entire visible sky every 40 minutes. Depending on the observational strategy, the data rate can be up to 100Gb per night. A robust, largely automatic reduction pipeline and advanced archive is used to serve data products to the Wide Area Search for Planets (WASP) consortium members. 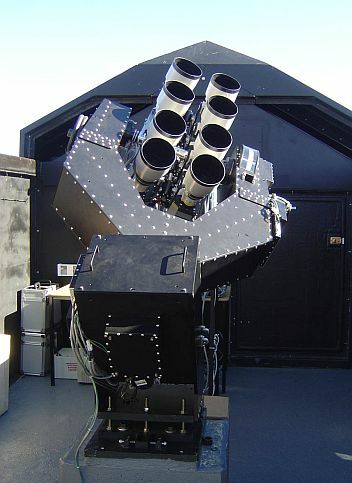 The Isaac Newton Group of Telescopes is a member of the WASP consortium and the design of the SuperWASP cameras was inspired by the early success of the CoCAM series of cameras designed and built at the ING from 1996 to 1998, one of which was responsible for the discovery of the so-called Sodium Tail in Comet Hale-Bopp 1995. The first planets discovered by SuperWASP were WASP-1b and WASP-2b in 2006. WASP-1b was named as "Garafía-1" after the name of the municipality that hosts the Roque de Los Muchachos Observatory, and both were actually the first ever exoplanets discovered at the observatory. Following this success, the WASP and SOPHIE collaboration announced the discovery of three more exoplanets: WASP-3b, WASP-4b and WASP-5b. WASP-3b is one of the hottest exoplanets discovered so far. At a temperature of more than 1700 degrees Celsius, WASP-3b has the potential to place stringent constraints on exoplanet atmospheric models. The discovery of the three transiting planets was named 'the 6th most important scientific discovery of 2007' in Time Magazine's Top Ten List. The first transits of WASP-3b were detected by the SuperWASP cameras in the Roque de Los Muchachos Observatory, La Palma. The transits were then confirmed by the IAC80 telescope in Izaña Observatory, Tenerife, as part of the Canarian Observatories' International Time Programme for 2007, and by the University of Keele 60-cm telescope. The discovery confirmation, using the radial velocity method, came from data obtained with the SOPHIE spectrograph on the Observatoire de Haute-Provence's 1.93m telescope. Observations made with the adaptive-optics system NAOMI+INGRID on the William Herschel Telescope were used to exclude the possibility of a nearby eclipsing-binary system being the cause of the transits. WASP-3, the host star, lies at approximately 220 parsecs or 720 light years and no companion stars were found to lie within 45 astronomical units of WASP-3. WASP-3b is one of hottest extrasolar planets ever detected. Credit: artist impression by IAC's multimedia service. WASP-3b has a mass of 1.6-1.8 Jupiter masses and it transists its host star every 1.8 days, one of the shortest orbital periods yet discovered. The finding of Jupiter-mass planets around other stars supports the idea that Earth-sized planets can also form and be detected as astronomers' technology improves. D. L. Pollacco et al., 2006, "The WASP Project and the SuperWASP Cameras", PASP, 118, 1407. A. Collier Cameron et al., 2007, "WASP-1b and WASP-2b: two new transiting exoplanets detected with SuperWASP and SOPHIE", MNRAS, 375, 951. D. Pollacco, et. 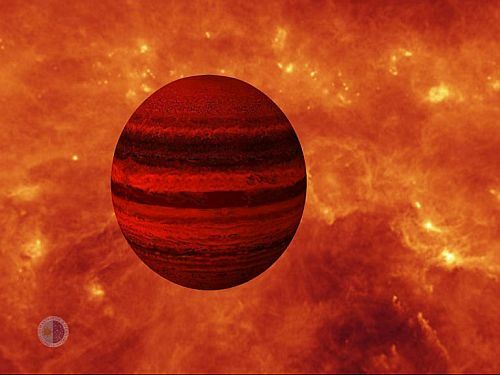 al., 2007, "WASP-3b: a strongly-irradiated transiting gas-giant planet", MNRAS, 385, 1576. A. Collier Cameron et al., 2007, "Efficient identification of exoplanetary transit candidates from SuperWASP light curves", MNRAS, 380, 1230. "Top 10 Scientific Discoveries - #6. "Hot Jupiters" Discovered", Time Magazine, 12th December 2007. "6th most important scientific discovery", 2008 STFC Annual Report, 70. "Three new WASP planets", Astronomy & Geophysics, 48, 6.5. Three New Planets Announced by UK's Planet Hunters, STFC press release, 31st October, 2007. Available versions: HTML | HTML local copy. D. Pollacco, 2007, "SuperWASP come of age", Frontiers, 26, 9. La Caza de Planetas Continúa. IAC Press Release, 26th September 2006. Available formats: HTML. Wide-Eyed Telescope Finds Its First Transiting Planets Around Distant Stars. RAS Press Release PN 06/36, 25th September 2006. Available formats: TXT (local copy) | HTML. "Un nuevo planeta llamado 'Garafía'", Diario de Avisos newspaper, 27 de septiembre de 2006. D. Shiga, 2006, "Third 'puffed-up planet' discovered", New Scientist News, September 2006. M. McKimm, 2007, "Reaching for the stars and planets", BBC News, 31 October 2007.